19 05 2009 - Twitter might not be the first place you’d think to look for video entertainment. But each day, legions of Twitter users post videos of breaking news, trending topics, wacky feline antics, and so on. All you need is a better way to discover them. Enter Twitmatic, from a company called ffwd. The second iteration of the service, launched Tuesday morning, lets you search, browse, rate, watch, and skip videos from throughout the Twitter universe with remarkable ease. 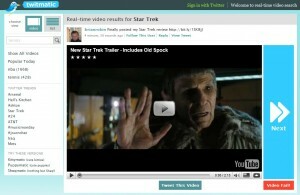 Search is the special sauce in this new iteration of Twitmatic, which launched two months ago. When you enter a search term, Twitmatic runs it through the Twitter API, looks for links from more than 5,000 domains known to host video (Roberts says competing services lack that sort of breadth) and imports them into the system. When other people search for the same term, the system accesses those videos faster than it did the first time, and presents the newer results. Meanwhile, in the background, Twitmatic runs searches using an index of search terms, which also helps speed things up, according to Roberts. 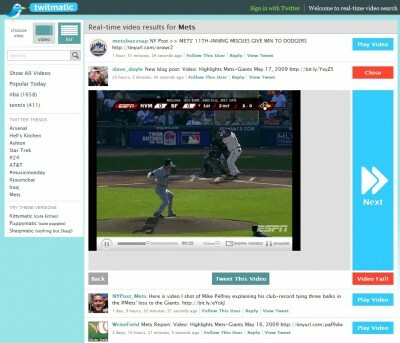 Aside from its transformation of Twitter into a television network for popular and arcane video, our favorite thing about Twitmatic is its no-nonsense interface. We’re hard-pressed to think of ways it could involve fewer clicks. We’ve been testing this thing for a few days now, and it has performed well, channeling Twitter’s inherent chaos into a smooth, lean-back video experience. Aside from the all-important search feature, the other main improvement in this version is a native Twitter log-in. 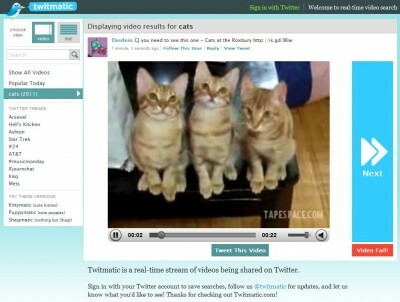 This means you can follow users, add videos to your Twitter favorites, and reply to tweets from within Twitmatic.